7 Nov 2015 7:20 pm ET: My research team and I are now in Cape Town, SA awaiting our flight to Novolazarevskaya Station in Antarctica. The first flight made it down but its return to Cape Town was delayed for a day due to less than good weather at Novo that kicked up just before they were to depart. Unfortunately the weather at Novo does not look great right now with a low pressure system moving into the area. We may have to wait a few more days beyond our normal departure day, which was to have been this Tuesday. Maybe we will get lucky and the weather will break in our favor early, we shall see. 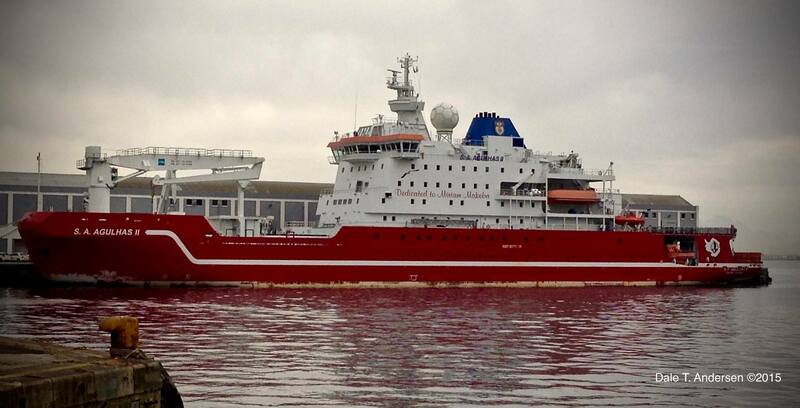 For the moment we are staying near the waterfront and the Agulhas II, South Africa's icebreaker/polar supply and research ship is in port adding to the local color and reminding us that we should be heading south.